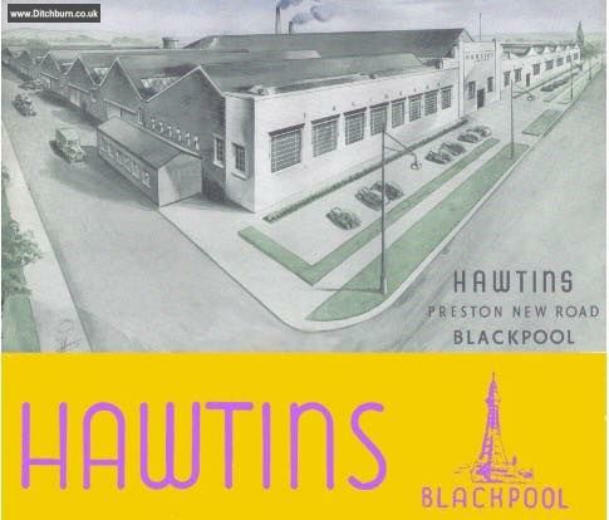 During the 2nd world war, engineering companies in the UK had been making munitions and military equipment, one of the many companies that did this was the Hawtin’s Novelty Company in Blackpool, In the war years the factory was turned over to the production of aircraft parts for the war effort, the enterprise was owned by Frank Hawtin, Frank had started the company in 1922 making wall machines for seaside amusement arcades and also larger floor standing machines in later years, Frank had started the business from a small premises at 17 Livingstone Road in Blackpool, Between 1922 and 1947 the company grew from the small workshop to a modern three and a half acre factory at Marton, Blackpool, employing hundreds of skilled engineers. 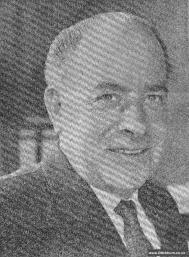 Jack Hylton did not have any manufacturing or engineering experience, so he turned to Frank Hawtin to assist him in producing his British built Juke-Box. 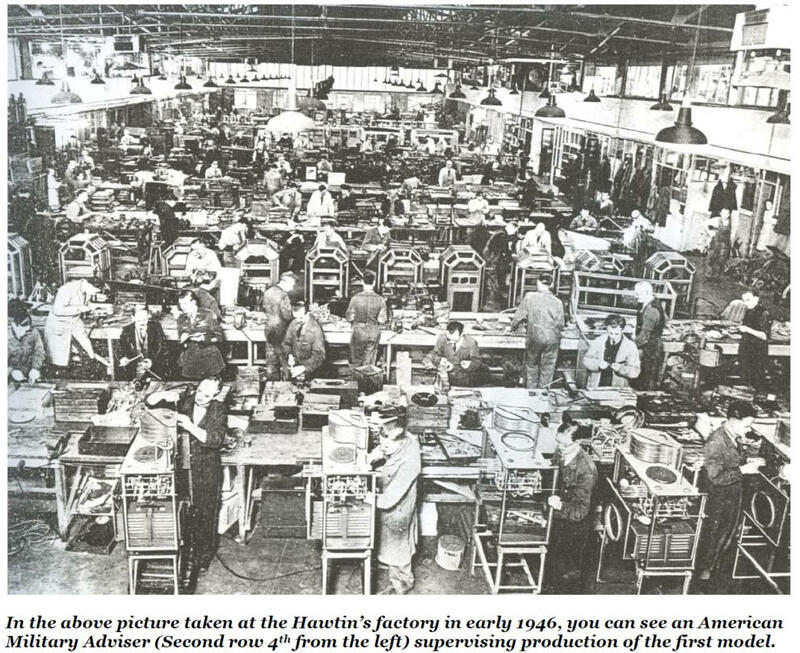 Frank’s experience in the amusement industry and the manufacturing knowledge obtained from making high quality military parts was important in producing a reliable and stylish machine, Unfortunately due to the rashioning of many materials at this time it was practically impossible to make a Juke box with the little materials that were currently available. Fortunately Jack Hylton’s contacts in the U.S. air-force could help them get around that. Jack Hylton’s connections with the US air-force were able to bypass the UK government restrictions on importing non-essential items, and parts for Juke-boxes would have definitely been classed as non-essential, although we are sure that circumventing UK government regulations was not exactly legal at the time, most of these machines when completed would be sited on American Air- Force bases to entertain the US troops, so it was in their best interest to make sure this all went without a hitch. 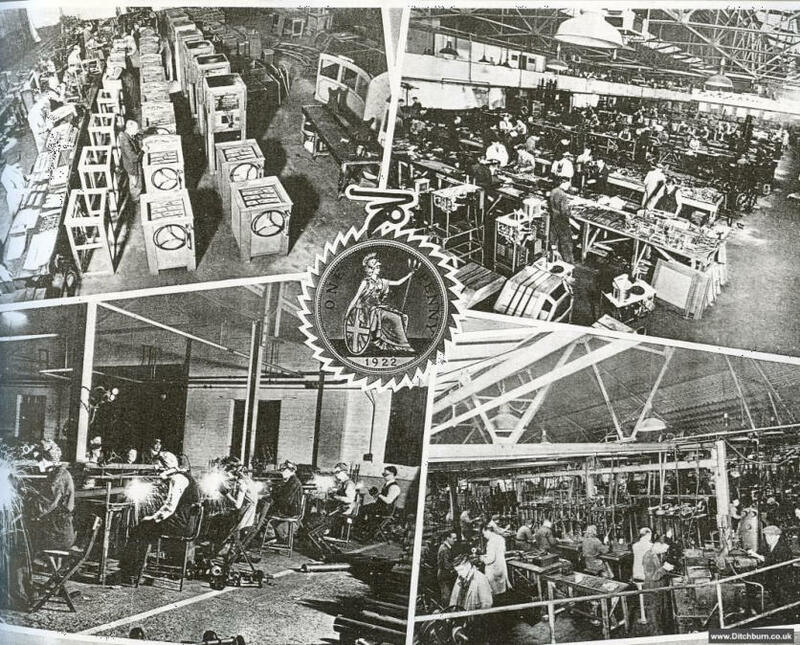 The 78RPM Wurlitzer Simplex mechanisms were shipped in wooden crates from the USA, these were transported on American supplies aircraft directly to the American air-force bases and then shipped to the Hawtin’s factory under strict US military supervision, the crates were marked up as “Essential American Supplies”. 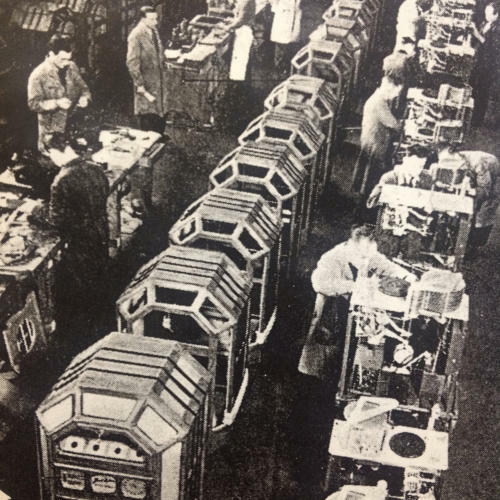 the crates were also an important part of the delivery as they were made from quality American oak, and these packing crates were then dissembled by experienced joiners and then hand crafted into the polished wooden cabinet of the Juke-box. 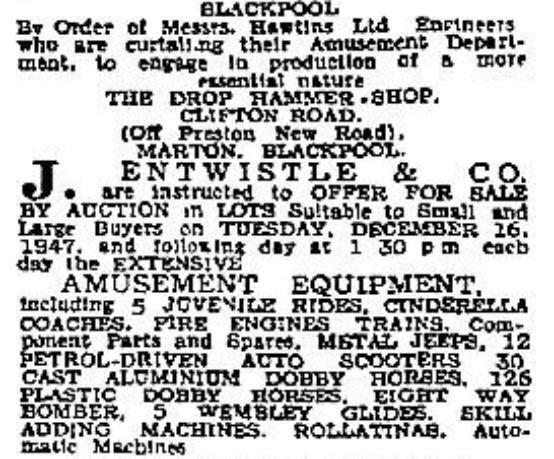 It was around this same time that Frank Hawtin had set his sights on bigger and better things, he decided to get out of the amusement machine business to concentrate on building a bigger engineering empire, The Jukebox manufacturing and tooling was being sold to Norman Ditchburn, and the rest was to be auctioned off on in a large sale on December the 16th 1947. in the auction advertisement below it shows that it included three Jukeboxes, but it is not known if they were the Jack Hylton Models. After the Sale, Frank and his Brother Percy moved onto bigger and better things, their first business venture was into “False Teeth”, something that had been greatly missed by many during the war, in 1949 the Blackpool factory was fully utilized with their company, Anglo-American Dental Corporation, maker of acrylic teeth, they both became millionaires, in 1968 they formed Hawtin Industries and had a large portfolio of companies, also 1968 Frank Hawtin was chairman of Dental Manufacturing Co. again in 1968 they acquired Park Brothers of Blackburn, an auto electrical company, by 1969 the main activities of Hawtin’s were manufacturing agricultural machinery, and automotive products, they also owned Cheswick and Wright a silencer company, and then they acquired Metropole Enterprises who’s main divisions were engineering, building and construction, they also acquired Cussins (Contractors), a house building company, and general contractors, then a partial takeover of Rawlings Brothers, a building and electrical contractor. 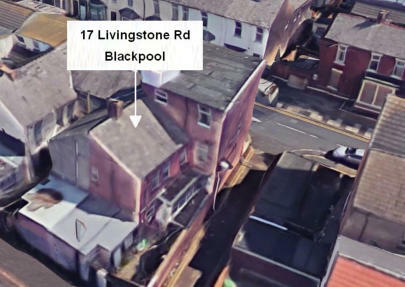 they also acquired a majority interest in Joylock Ltd, a property developer of South Wales. and by 1970 they were merchant bankers offering financial services. 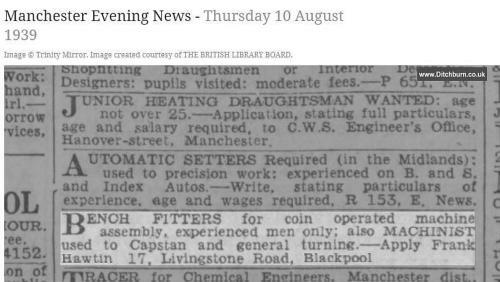 A long way from the days of making amusement machines in a small workshop at 17 Livingstone Road.